11.30.040 Block and lot requirements. The purpose of this chapter is to establish regulations and provide appropriate flexibility within this title to promote quality development. Sections within this chapter apply generally to all lots and parcels, and to modifications of the provisions of this title. Sections within this chapter generally modify or apply special conditions to zones or other standards of this title. The director shall have the responsibility to determine the appropriate use of these standards and to exercise applicability on an individual project basis. All appeals of director decisions shall be subject to the process standards of Chapter 11.50, Administration, and Chapter 11.51, Permits and Procedures. The design standards of this title are intended to promote quality, orderly development within the city. As identified in Table 11.30-1, Administrative Modifications, particular design standards of this title may be adjusted, subject to the applicant providing the necessary information for the director to make an informed decision in granting or denying the request for modification. The director may elect to refer the application to the planning commission. A. Administrative Modification. Upon determination by the director that the modification request is consistent with the applicable requirements of this title, the identified standards may be modified administratively, consistent with Table 11.30-1, Administrative Modifications. The director may allow modifications beyond the limits identified in Table 11.30-1 if the director deems such modifications to meet the intent of the general plan and this title, and the requests are not determined to be major modifications. Additionally, the director may approve multiple modifications beyond the limits of Table 11.30-1 under one application, and would not require multiple review periods. B. Major Modification. Requests that are deemed by the director to be major or significant (i.e., requiring approximately four or more variances or modifications), but are consistent with the intent of this title, are to be processed with a recommendation from the director for review and action by the planning commission or city council. C. Limits of Modifications. Upon determination by the planning commission or city council that the request for a major modification does not comply with the intent of this title, such request shall be deemed ineligible for a modification and shall be processed as a zoning code amendment or variance, consistent with Chapter 11.50, Administration, and Chapter 11.51, Permits and Procedures. A. Blocks. Should be walkable from one intersection to the next, providing a continuous and cohesive sidewalk. All parcels with frontage along the same right-of-way shall contribute to (financially or through the development of) the continuous and consistent pedestrian sidewalk. B. Lot Width Standards. The development of blocks is intended to create a cohesive and pedestrian-friendly environment at a walkable scale. Individual parcels or projects shall contribute to the creation of blocks, consistent with the standards of this title. C. Minimum Lot Area. All lots shall conform to the minimum lot area requirements of the applicable zone. Any lot may be subdivided, including through-lots, where all the resulting lots meet the minimum lot requirements of the applicable zone. the applicable zone on both frontages to maintain neighborhood character. All development in all zones shall be subject to the following standards. A. Main Building Structures. An accessory building shall not be constructed or maintained on a property without a main structure without a temporary use permit. 1. Accessory structures shall not be permitted between the main structure and the street frontage unless approved by the director. In such cases, the approved accessory structure shall not violate the minimum front property line/frontage setback requirements. B. Dwelling Unit Size. Each newly constructed dwelling unit shall contain a minimum square feet of floor area consistent with Table 11.30-2, Minimum Dwelling Unit Size, based on the number of bedrooms. 1. The width of the driveway shall be limited to the width necessary to access the permitted parking spaces. The full width of the driveway shall terminate into a garage or carport; narrowing of the driveway width is allowed to facilitate site design. 2. Driveway depth shall be regulated per the following to properly facilitate lot layout and on-site parking. Short driveways for NL zone small lot configuration and NM zone lots are permitted at three feet from the back of the curb. Standard driveways with a depth of eighteen feet or greater from the back of the curb are permitted for any NL zone or NM zone lot; resident or guest parking is permitted in a driveway with a minimum depth of eighteen feet. A driveway with a length between three feet and eighteen feet shall not be permitted. See Figure 11.30-1 for a diagram of this standard. 2. Secondary entrances shall have architectural features that are smaller in height and width, with fewer or simpler architectural elements than the primary entrance in scale and detail. 5. Other landscape, architectural, or site development feature, as deemed appropriate by the director. ii. Emanate only from fixtures located under canopies or hoods, under eaves of buildings, or at ground level in the landscaping. 4. See Section 11.33.070(H), Parking structure guidelines, for parking structure lighting regulations. G. Service Areas and Mechanical Equipment. Service areas, service entrances, and mechanical equipment shall be visually unobtrusive and integrated with the design of the site and compatible with the building. 1. 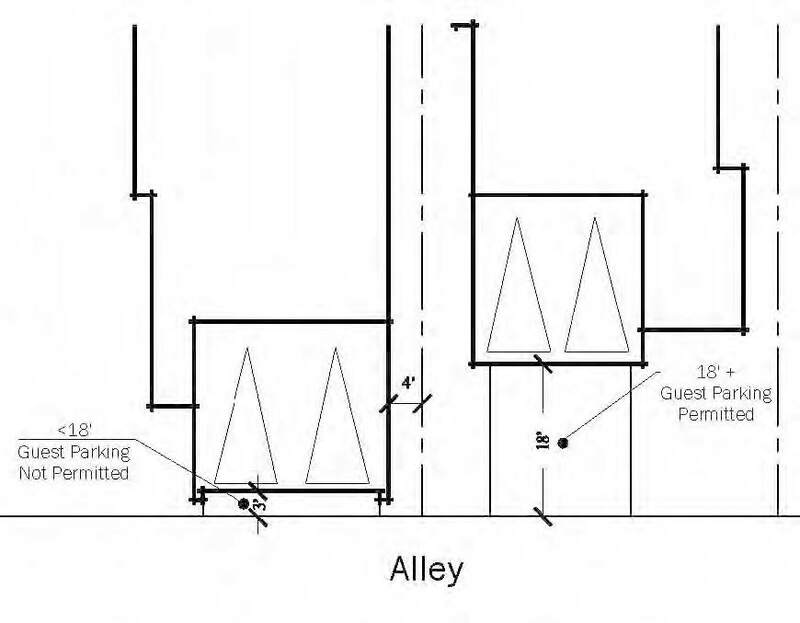 Service entrances, waste disposal areas, and other similar uses shall be located adjacent to alleys and away from the primary frontage of the lot. 2. Utility boxes shall be positioned to not be seen from the primary frontage of the lot by locating them on the sides of buildings and away from pedestrian and vehicular routes, or by locating them within interior building corners, at building offsets, or at other similar locations where the building mass acts as a shield from public view. 3. Air intake and exhaust systems or other mechanical equipment that generates noise, smoke, or odors shall not be located on or within ten feet of the front façade (including side street façade). A. Public Utilities and Easements. The installation, maintenance, and operation of public utilities, subject to the regulation of the California Public Utilities Commission, shall not be hindered by the provisions of this title. This title does not restrict the right of a public utility to increase the capacity of facilities necessary to and used directly for the delivery of or distribution of services. 1. Public Easements. All developments that include mapping of private streets or provision of public utilities on site shall record public utility easements over the entire private street network and over other portions of the project to accommodate access and urban infrastructure. The planning commission may also require access routes necessary to ensure that firefighting equipment can reach and operate efficiently in all areas of the project. 2. Residential Neighborhood Zone Provisions. All required yards in the NL and NM zones shall be maintained regardless of the installation of a public utility. Such installation or utility maintenance shall not require enlargement of the site. B. Utility Service. The developer or owner of a property shall be responsible for utility service connections, in cooperation with the responsible utility companies. 1. Undergrounding. All new development and new subdivisions shall be required to install on-site utility, phone, and cable television/Internet facilities underground in accordance with the respective industry standards. Transmission lines shall be exempt from this requirement. 2. Screening. Transformer, terminal equipment, and public utility boxes shall be undergrounded where possible. Where utilities are located within view of public rights-of-way due to utility or site constraints, all transformer, terminal equipment, and public utility boxes shall be placed underground when feasible. If not feasible, the utility shall be screened from view, equal to the height of the equipment, from streets and adjacent properties. Screening shall be architecturally similar to the closest primary structure. i. Antennas shall conform to required setbacks consistent with accessory structure setbacks within the applicable zone; see Chapter 11.43, Second Dwelling Units and Accessory Structures. ii. Antennas shall not exceed sixty feet in height, as measured from the finished grade of the lot, except with the issuance of a CUP. A. All additional security fencing beyond six feet may be permitted up to a maximum of eight feet subject to an administrative plan review. B. Security fencing may be permitted between residential uses along interior or rear property lines subject to an administrative plan review. 3. The property is adjacent to a road, alley, or utility or easement where security is a concern.